On Monday August 17th, I received my schedule for the biopsy along with this email..
"We sent a requisition for you to do some labs required for your biopsy…….sent to ""Life Labs"", there are many scattered about Ontario but if you have a lab that is easier for you we can re-send in the morning. You'll need to go anytime tomorrow or Wednesday morning to have the results for Thursday." Luckily for me, Life Labs has a location a few blocks from my work and I was able to go in Tuesday for the blood work! The biopsy itself was scheduled for 9:00am on the 20th of August, but they ask that you arrive an hour early. The biopsy procedure took place in the Medical Day Unit on the 7th floor of Toronto General. After registering at the reception desk, they led to me a room with 2 beds in it, kind of like a regular hospital room, but much more 'clinical' looking. At the foot of each bed, on a table, was this cloth bundle of 'tools' for the procedure. After 5 or so minutes, my transplant coordinator and doctor walked in and we chatted for a bit about the test and just made general small talk. The doctor started prepping the items needed for the biopsy and explained that the surgeon was running late with meetings, but was in fact, on his way to the room. She also explained that this surgeon was the best one to be doing this procedure, after all, he is the director of the Liver Transplant Unit. To my surprise, she also told me they would freeze the area before they took the sample! Score!! It was also explained to me that I may have some shoulder pain and that pain medication would be available to me if needed. Also, I would have to stay in this bed for at least 4 hours to make sure there was no bleeding. As I was waiting for the surgeon, another young fella scheduled for the same procedure came into the room. Turns out this guy, Richard was his name, is donating a piece of his liver to his dad...and if his biopsy results were good, his surgery could happen as soon as next week! Pretty cool! We chatted back and forth until the surgeon arrived. Yes, the open front robe! For a brief minute I was in robe heaven! Sadly, there was only one robe to be put on as an exchange for my shirt. Guess they don't want to get 'biopsy goo' on your shirt. The surgeon talked more about the procedure stating that even he had undergone the procedure so he could experience what it was like! Nothing he said could never have prepared me for what was about to happen. It all started with me raising my right arm above my head as I was laying down, some sterile sheets were draped across my chest and he swabbed my rib cage with stinky sterile goo. 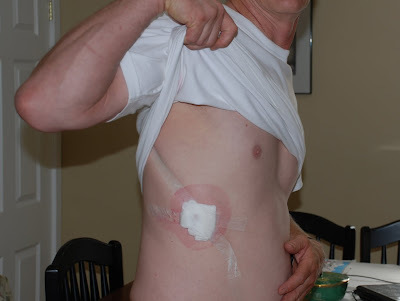 He tapped his fingers around my chest explaining he was locating my liver, once he found the spot he would take the sample from, he pressed a quarter into my skin making an indentation. More stinky goo was swabbed on and he explained he was going to start freezing the area. The first couple of needles didn't really hurt, it just felt like pressure. As he went deeper though, I could feel it....as he was jabbing around, he was talking the entire time. He then said he was ready to take the sample, he picked something up off the table and I felt even more pressure on my side. In a split second, it felt like something tore through the middle of my chest straight up! It startled me so much I looked down at my chest expecting a frickin' alien to shoot out! Holio Christ it hurt! Then it was over...and immediately, a really dull pain shot through my shoulder. The surgeon taped a huge pad of gauze to the biopsy site and then showed me the needle he used to get the sample. Now there was no way that needle made it in to the middle of my chest, but that's how it felt. It was the weirdest sensation I have ever experienced!! Both the surgeon and the doctor explained that to get the sample from the liver, they had to go through some pretty sensitive nerves and tissue. As soon as I caught my breath, I yelled over to Richard that he was in for a treat! Nurses then came in to monitor my temperature and blood pressure. They offered me pain medication but by this time, there really was no pain, just some discomfort in my shoulder. My whole chest was frozen! After Richard had his biopsy done, we chatted about the weirdness of it all and I tried to get some sleep. When I was allowed to leave the hospital, I shook Richards hand and wished both he and his dad all the best. By the time I got home, my side was sore, red and tender. It almost looks like dye! Needless to say, I slept on the couch Thursday night.